We are independently owned and the opinions expressed here are our own. We have an affiliate relationship with and receive compensation from companies whose products we review on this site. Mattress shopping can be intimidating. You only buy a new mattress a few times in your life, and the periods between purchases can be as long as 20 years, so it’s hard to keep track of the latest changes an innovations in the mattress industry. 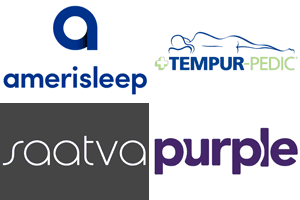 Most people have heard about the Tempurpedic mattress, thanks to the frequency and wide-spread nature of their commercials. However, many people may not know about the different competitors that offer a nearly identical product for a fraction of the price. If you’ve been interested in or thinking about a memory foam mattress, you should investigate the Novosbed mattress today. Should I Buy the Novosbed Mattress? The Novosbed is 11” thick and is constructed from three layers of foam. The bed is offered in 3 different firmness levels, and this review will cover the most balanced option of the three. Top – the top layer provides cooling and comfort. It is made from 2” of ultra-dense memory foam. This gives a much cooler sleeping surface than some of the other memory foam options that Novosbed could have gone with. Furthermore, this material does a good job of working to relieve pressure points, especially those than can form in the neck and back. The mattress has large scoops taken out of it that improve airflow and further contribute to the cooling. Middle – the middle layer is constructed from 2” of ultra-dense memory foam. It works to act as a transitional layer between the top level and the foundational layer. It provides deep compression support and helps the mattresses responsiveness. Bottom – the bottom layer acts as the foundational layer of the mattress, it is made from 7” of support foam. 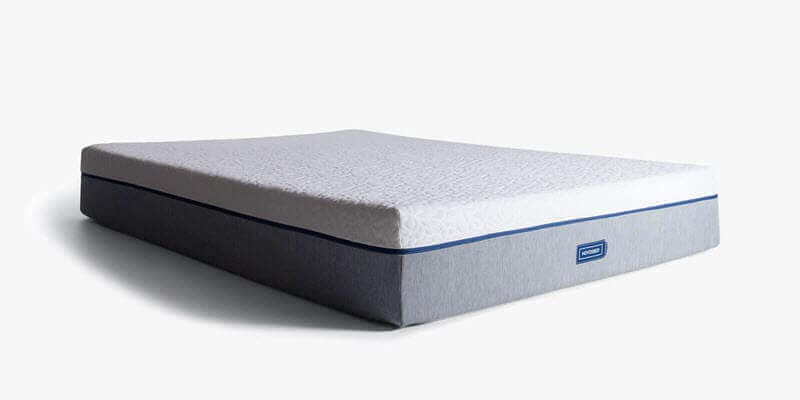 It helps the mattress keep its shape, and provides deep compression relief to support heavier sleepers and those who need extra support to help manage pressure points while they sleep. As you can see, the Novosbed is designed to be a general audience style bed that most sleeper will enjoy, rather than focusing on one particular type of sleeper or by focusing on those at the extreme ends of the firmness scale. The Novosbed cover is a step above the average online foam mattress retailer, and speaks well for the quality and care that went into making the Novosbed. It uses the standard white-grey color scheme common to foam mattresses, with a stylish blue zipper that does a nice job detailing the cover. The white top has a floral design that is also distinctive. The cover is made from polyester, silica, modacrylic, and Tencel in a ratio of 68/14/10/8 accordingly. The side panels use a combination of 57& polyester, 24% visil, 5% polypropolene, 4% silica, and 3% modacrylic. This gives the side a more rigid feel to help with edge support and to help the mattress maintain its shape and durability. All off the materials are stretchy and soft, and they are very responsive. The blue zipper isn’t just there for looks. It lets you remove the cover’s top so you can wash it in a washer or dryer, rather than doing spot cleaning, which can be a hassle. This is a nice touch from Novosbed, as most removable covers are not machine washable, and they must be dry cleaned, if even that. In tems of firmness, Novosbed is offered at three different levels, soft, medium, and firm. On a scale from 1-10, with 1 being the least firm and 10 being the most firm, the soft option from Novosbed rates as a 3, the medium option at a 5.5, and the very firm option as a 7.5. Additionally, you can use the Novosbed Comfort + kit. This can move the mattress up or down on the firmness scale by 1 in any direction, giving the Novosbed mattress a possible firmness range of 2 to 8.5. The Comfort+ Kit consists of a foam insert that is inserted under the top cover of the bed. This gives even greater flexibility and allows sleepers to get the feel that’s just right for them. The Novosbed also does a good job of staying cool while sleeping. It’s hard to find a mattress with good hug that still remains cool. However, the porous top layer allows for good airflow, which is especially important for the layer that is in contact with your body and thus getting most of the heat. This airflow moves the heat around the mattress and allows it to disperse. One of the most common complaints with foam mattresses is the warmer sleeping surface they usually offer, but that isn’t the case with the Novosbed. The end result of all of this is a very balanced sense of support. 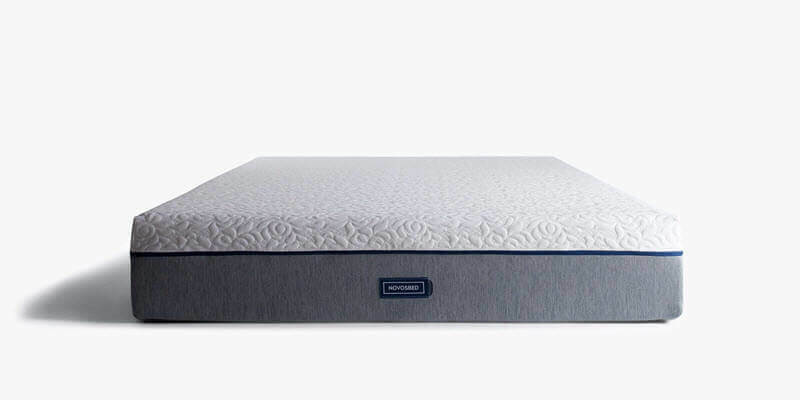 The combination of foam layers and the choices for the foam do a good job of providing pressure point relief while also creating a comfortable sleeping surface with a moderate amount of hug and contour. We do sinkage tests on all the mattresses we review. They give a good idea of how the mattress will hold up over time, as wel as providing asolid indication of what it will feel like to sleep on the mattress. Our tests are conducted by an individual who weighs ~140lbs, and so your sinkage results might be different than the ones we encountered. Laying on Back – laying on the back in a normal sleeping position with the body weight evenly distributed resulted in 2” of sinkage. Laying on Side – in a normal side sleeping position, with the body weight evenly distributed caused 2” of sinkage. Slight Edge Sit – sitting on the edge of the bed, but not letting the bed take the full weight of the body created 3” of sinkage. Full Edge Sit – sitting with all the body weight directly on the edge resulted in 4” of sinkage. Standing in Middle – standing in the middle of the mattress created 5” of sinkage. As you can see, the sinkage numbers on the Novosbed mattress are much better than many of the other foam mattresses we’ve looked at, even at its price point, which is in the middle of the foam mattress selection. Novosbed frequently has sales running on their site, and they offer free promotional discounts at a number of different places on the internet. Make sure you look around and see if you can find one, as these discounts can make the already – reasonable Novosoft mattress even more competitive. Shipping – The shipping is free. The mattress frequently ships within 24 hours of ordering, and arrives in from 1-6 business days at your door compressed into a box. Warranty – 15 years, a bit more than the industry standard of 10. Trial – Novosbed gives you 120 nights to see if their mattress is right for you. There are plenty of people who would find the Novosbed to be a good fit for them. The first group is people who want to have precise control over their firmness level. The Comfort+ kit is a great feature for these sleepers because it means that the Novosbed covers almost any sort of firmness you can desire. This level of flexibility and fine tuning is impressive, and difficult to get from one company, usually precise firmness seekers have to try combinations of different products to find the right match for them. The Novosbed is also a good choice for people who like lots of hug. The high density memory foam that makes up the top two layers of the Novosbed provide a more pronounced hug that is still fairly responsive to movement, allowing it to change shape when you move and providing a consistent feeling. Additionally, the Novosbed is a great option for deal hunters. It performs along the lines of the Tempurpedic mattresses, but for less than half the price. That makes them an excellent value. The value gets even better when you consider the different levels of firmness that Novosbed offers, along with the more advanced cooling and airflow techniques that it provides. 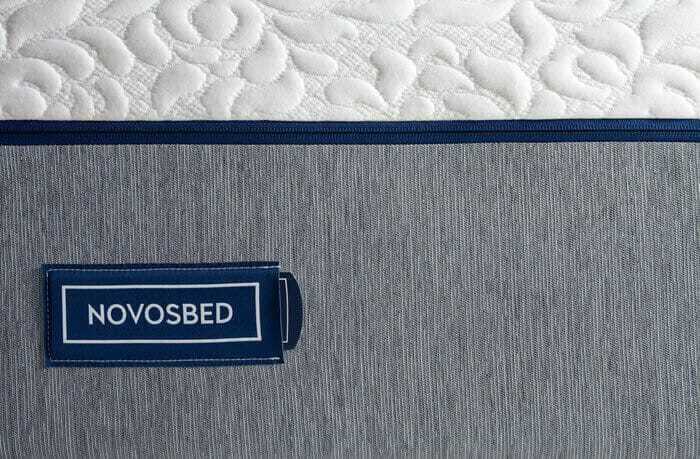 Finally, people who are looking for pressure relief will love the feel of the Novosbed. It evenly distributes the body’s weight in a way that will let you sink in a bit deeper to the mattress without creating too much hug or giving you a trapped or sinking feeling that is common in a lot of foam mattresses. These qualities also mean that it does a good job of letting your spine and back rest in their natural alignment, so you can wake up in the morning with less soreness and reduce the amount of aches and pains you have to fight through first thing in the day. On the whole, the Novosbed is a solid choice for most sleepers. It provides great comfort and coolness, along with pressure support and a level of fine tuning practically unheard of in the mattress world, while at the same time. When you take into account the frequent deals and promotional discounts that Novosbed offers, it’s easy to see why they’re such a popular brand of mattress. This is especially true when you stack them up against some of the mattresses of a comparable quality and made from comparable materials, like the Tempurpedic line of mattresses. The result is that the Novosbed mattress provides a range of options suitable to any sleeper while costing less and performing better than some of the most expensive mattresses on the market today. Copyright © 2019. The Best Mattress Reviews. 252 N Illinois St, Indianapolis, IN 46204.